Muslims around the world are celebrating one of their most important holidays, Eid al-Fitr, which marks the end of the holy month of Ramadan. In Russia, Muslims also flock to morning prayers, including the thousands expected to descend on Moscow Cathedral Mosque. Holiday celebrations begin after a new moon is sighted in the sky, which means the date for Eid varies from country to country. However, after failing to spot the new moon, religious authorities in the Gulf Arab countries – Saudi Arabia, Qatar, the United Arab Emirates, Bahrain and Kuwait – agreed that the three-day festival will begin on June 6. Ramadan is the month of fasting for Islam adherents which precedes Eid. During the holy month, Muslims from dawn until dusk are forbidden to consume food and drink, engage in sexual relations and other “sinful” behavior. Eid al-Fitr, or “festival of breaking of the fast”, is celebrated on the first day of the 10th month of the Islamic lunar calendar and begins when a new moon is sighted in the sky. After morning celebrations worshipers return home and continue festivities with their loved ones, neighbors and friends. In Russia, Islam is the second most widely spread religion after Orthodox Christianity; some 20 million Muslims living in the country make up around 15 percent of the population. 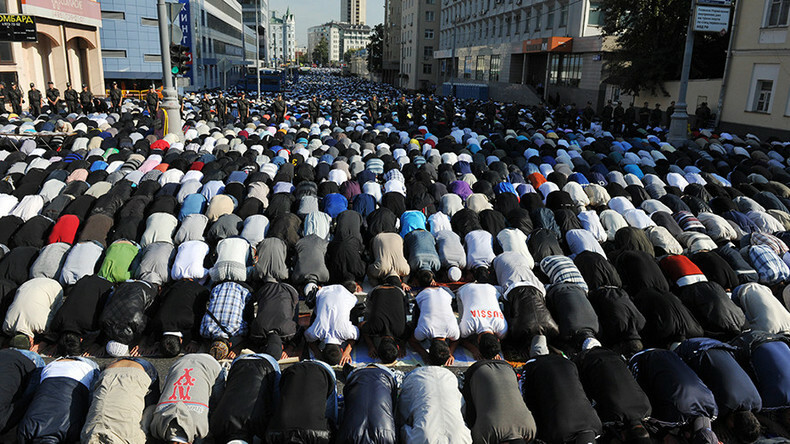 Over 200,000 of Muslims in Moscow are expected to take part in morning prayers, according to the Russian Council of Muftis. The ceremonies will be held in the city’s four main mosques including the Moscow Cathedral Mosque and several squares across the capital. Moscow Cathedral Mosque is one of the largest mosques in Europe and can hold some 10,000 worshipers. It was opened in September 2015 after several years of reconstruction. The original structure was built in 1904. Over 37 locations in the city’s suburbs will be available for worshipers to conduct religious rituals. Rawil Gaynetdin, the chairman of Russian Council of Muftis, sent his greetings ahead of the celebrations. “Having been able to suppress desires of the body during the whole month, worshipers proved to themselves that they have the power to control them [their desires], [they proved] that spirituality rules over the corporeal,” he said. At least 60,000 Muslims took part in celebrations near Moscow Cathedral Mosque, police sources told TASS. Eid al-Fitr celebrations also took place across Russia. The day is considered an official holiday in several Russian regions with predominantly Muslim populations.